ACTA VETERINARIA BRNO is scientific journal of the University of Veterinary and Pharmaceutical Sciences in Brno, Czech Republic. 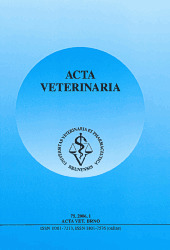 The scientific journal Acta veterinaria Brno is dedicated to the publication of original research findings and clinical observations in veterinary and biomedical sciences. Original scientific research articles reporting new and substantial contribution to veterinary science and original methods that have not been submitted for publication elsewhere are considered for publication. A written statement to this effect should accompany the manuscript, along with approval for publication by the author´s head of department. The authors bear full responsibility for the contents of their contribution. Book reviews are published, too. The Editorial Board reserves the right to reject manuscripts that are not in the scope of the journal, or do not meet the requirements for publication. The manuscripts are independently reviewed by referees that are anonymous to authors. When the Editor has received written opinions of referees, he will relay these to the author. The final decision concerning a revised manuscript is the responsibility of the Editorial Board.